CD review: "Lightnin', Joel & John Henry"
This review first appeared in the Summer 1992 edition of Blues Revue Quarterly magazine (now Blues Revue). This collection by the legendary Sam "Lightnin'" Hopkins and his two older brothers, Joel and John Henry, is an experiment that worked very well. 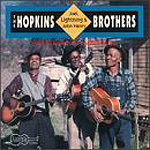 The experimental nature of the recordings comes from the fact (explained in the liner notes) that in 1964, producer (and Arhoolie label owner) Chris Strachwitz tagged along with Sam and Joel when they tracked down an elderly and ailing JOhn Henry, whom they had not seen for some years. Lightnin' insisted the three brothers record together, so Strachwitz set up his portable tape recorder while the three musicians entertained themselves and their mother in John Henry's rather primitive shack (the photograph on the sleeve proves this description is no mere romanticization). Despite the less-than-ideal recording setting, the clarity of the music is quite good, and the music that resulted from this family reunion is a wonderful slice of indigenous American musical history. While most blues fans are familiar with Lightnin's clean, modern-sounding traditional blues, Joel and John Henry are virtual unknowns (although Joel did record a few albums on his own). Joel plays in the traditional country style of Blind Lemon Jefferson, with whom he once lived, while John Henry's music is a vibrant, rough and rambling music, depending more on force of delivery and charisma than precision or technique. Lightnin', as he was wont to do, improvised much of the material on the spot, such as the lead tune, "See About My Brother John Henry," which Strachwitz believes was made up right then, as he also believes was "I Got a Brother in Waxahachie" (the town where Lightnin' had finally tracked down John Henry). During the performances, the brothers encourage each other with shouts or asides, and the three acoustic guitars cut in and out of each other with the easy familiarity that only a jam session can engender. There are a few duets, but for the most part one or the other of the three is singing and playing lead guitar. There isn't generally a rhythm or harmony guitar, just one of the brothers breaking in for a measure or two to add his two cents' worth. Even casual fans of the blues will be surprised by the listenability of the music and the clean sound of the recording.